The Best Trimmer Line On The Market? Here Are The Top 5 Brands! / The Best Trimmer Line On The Market? Here Are The Top 5 Brands! There are a lot to learn in life’s misadventures, I always say. This time, I was in need of a good, or rather better trimmer line as the one I had recently bought melted into itself after a couple of uses. A phenomenon trimmer experts call welding. I called it one big Titan Arum. I had to look for the best trimmer line I could afford. What happened to the line that came with my trimmer (aka weed eater)? The Best Trimmer Line On The Market? It was a sunny Wednesday morning as I went out into my yard to trim the remaining uncut grass from yesterday’s mowing. I readied my string trimmer (or and heard the familiar humming of the battery-operated engine as the trimmer head started to spin. I’m quite thankful I had worn safety glasses that day because grass and plastic debris started flying towards my face. I was told that my old trimmer line had become too brittle for use. I hurriedly, and mistakenly, bought a cheap replacement – that eventually melted. Apparently, cheap trimmer line doesn’t do well with the build-up of heat in your trimmer head. The first lesson learned. Quick Tip: Before purchasing a line, Check your specific trimmer about the trimmer lines it’s capable of holding! Here’s a quick look at the top five best brands. Under them, I’ve put in links to different sizes for round trimmer lines, as well as links to the other types of trimmer lines, if available. I didn’t want another welding incident, so I looked through tons of articles, guides and dozens of different trimmer line brands and products to find the best trimmer line. 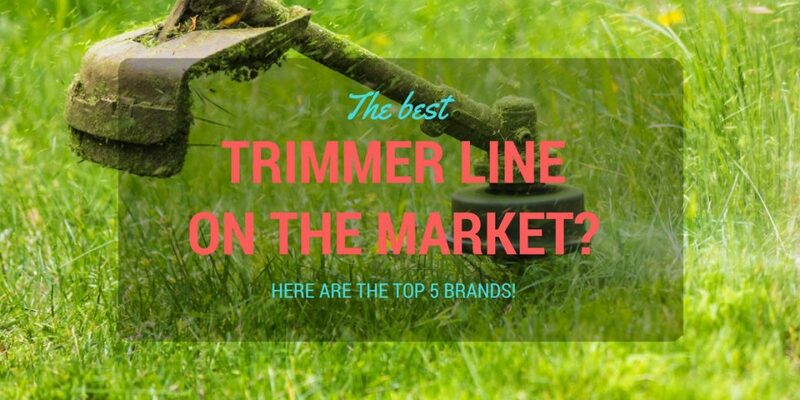 I learned that most brands offer all the different types and kinds of trimmer lines that you might need, so I settled on reviewing the brands themselves over individual trimmer line products. I eventually settled on Husqvarna’s Titanium trimmer line for light trimming jobs (more on this in the guide below), but of course you can choose for yourself which brand to buy from. In may take some trial and error, especially with the different line sizes, as you figure out which one will be perfect for you. I’ve learned that not all trimmer lines are equal. Its brand is significant, but success will rely heavily on the chosen trimmer lines’ shape, line size, and planned use. If you want that clean, manicured look. You have to consider these factors. You may have noticed the line size in 0.085 or 0.130 inches in the quick look table. The diameter measurement of a trimmer line is its line size or gauge. It ranges from 0.065 to 0.155inches. The line size that you will need depends on how dense or heavy the trimming will be. 0.065” to 0.080” – These trimmer line sizes are designed for light and minimal trimming in residential and other small properties. 0.085” to 0.105” – The medium-sized lines are for denser weed, grass, and shrubbery trimming in large properties. It’s also used in light commercial lawn care. Experts say that the safest line sizes to use is up until 0.095inches. Any higher and you’ll risk damaging property. Thicker sizes can greatly damage your curbs, fences, and sprinklers! 0.110” and above – the thickest and heaviest of the line sizes best suited for vast properties with very dense grass/weed/woody plant growth. You’d see these being used in golf courses. I wouldn’t recommend trimmer lines thicker than 0.110” for homeowners, but if you own a commercial lawn care business, these are a great investment. In addition to the variety of trimmer line thickness, they also come in different shapes, serving different purposes. Each of these has their own pros and cons. The round-trimmer lines are the most common line type and what you would usually get with a new string trimmer. They’re made for everyday use and are commonly utilized in residential areas. Thicker lines, however, are available for commercial use. As suggested by its name, multi-sided trimmer lines are ribbed and shaped to have corners. The shapes can come it squares, pentagons, and stars. These are usually utilized by professionals for medium to large properties with heavy lawn care needs. They cut cleanly through thick weeds and grass. Many communities frown at and even prohibit, loud machinery and power tools so a gas-powered weed eater is not recommended. Weed eaters powered by batteries or electricity will be used in these areas as they have much quieter engines. Twisted trimmers lines are designed to emit very little noise, so these are a favorite with quieter trimmers. Interestingly, they have all the advantages of both round and multisided lines with the added benefit of reducing your weed eater’s vibrations. That may be a small thing, but a great amount of fatigue is spared when vibrations are weaker. Like shark teeth or your favorite steak knife, serrated trimmer lines are designed for thicker blades of grass, heavy and dense lawn maintenance and very large plots of land. What are trimmer lines made of? Are lines made of Titanium worth the investment? With the titanium trimmer lines I’ve used, I can say that they are worth the investment. They’re durability, and more efficient fuel consumption will add up in the long run. Are trimmer line colors important? No, line performance is not affected by its color. However, you may want to get dark green lines if possible. As their ends wear out and eventually break off the line, the dark green plastic pieces will disappear into your lawn. Unless you want colorful specks in your garden, then yellow, or red are good too! Take periodic breaks. The vibrations emanating from weed eaters can severely fatigue you and affect your muscles and nerves during prolonged use. Now that you know how to pick a good trimmer line let’s see how you can best maintain them. To avoid melding or brittle trimmer lines, you can soak them in water for at least 24 hours. The lines will absorb the water and result in greater durability and flexibility. Avoid running your line trimmer or weed eater at maximum power. This generates a lot of heat and can lead to me melding. Try to trim foliage with or closer to the ends of trimmer line during operation. Trim grass from tip to root. When trimming very thick or heavy branches, and weeds, you can opt for a metal weed blade attachment instead. Unlike trimmer lines, you should run these at full throttle. Rinse trimmer lines thoroughly after use. Don’t expose your trimmer lines to direct sunlight which will make them brittle. You’re now fully equipped to pick the best trimmer and keep it in good condition. It’s not really about a specific product but the one that will be the best fit for your intended use, under a very good brand. Happy trimming and keep those safety glasses on? Did we miss something? Comment below!